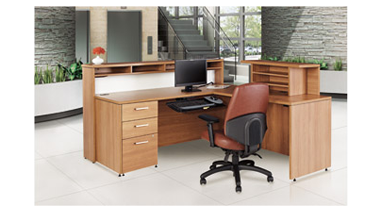 The clean, modern design of Ionic supports a wide range of workspace applications. All drawers have ball bearing over-travel slides. Accented by 2mm matching edge, silver colour handles and locks. Dark Espresso finish. 72"W x 84-1/2"D x 42"H. Ready to assemble. Features 1" thick surfaces and gables and adjustable levelling glides. Reception Desk L-Grouping. Includes reception desk with mantle, glass panel with light and return and box/ box/1 file pedestal.